Turas fiadh-bheatha Odisha le Sandpebbles - Eachdraidheil le nàdar, Flaura agus Fauna Odisha. A 'lorg fìor fhìor-bheathaichean fiadh-bheatha? Cuairtean Fiadh-bheatha Is e Odisha an ceann-uidhe as fheàrr agad a thadhal! Ged a tha na tràighean agus na teamplan a 'toirt dhachaigh a' bhata airson a bhith a 'còrdadh riutha, tha na Tursan Wildlife Odisha iongantach. Le grunn phàircean nàiseanta, stòrasan tìgear, agus ionadan fiadh-bheatha, tha gnèithean fauna agus flùraichean mì-chliùiteach aig an stàit nach fhaigh thu àite sam bith eile air an t-saoghal. Be e na Coilltean Mangrove & Wetland de Bhitarkanika no coilltean Chandaka, a h-uile crann agus cranny de stàit Innseanach an ear a 'gabhail a-steach fiadh-bheatha beairteach. Air do Thurais Wildlife Odisha , gheibh thu cothrom air beathaichean fhaicinn timcheall air an àrainn neo-ghluasadach, ag èisteachd ri na fuaimean aca agus a 'faireachdainn gu bheil do chridhe cridhe ag èirigh le tlachd. An seo, faodaidh tu fianais a thoirt air ceudan de ghnèithean creutair eadar-mheasgte a 'gabhail a-steach tìgear, ailbhean, crogall, fèidh, seacal, agus mòran eile san àrainn nàdarra. 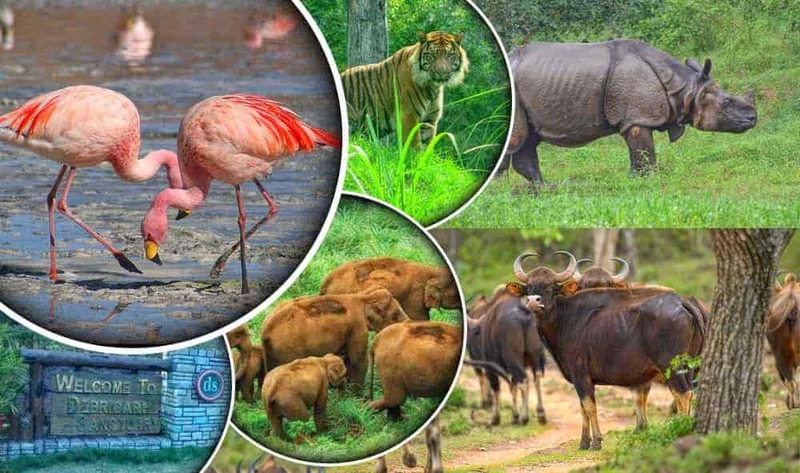 Tha ar pasgan-turasachd Wildlife Tours, Odisha, air a dhealbh airson do ùidhean agus a 'tairgse cothrom a bhith a' faicinn an fhiadh-bheatha as fheàrr a tha aig an stàit. Teachd aig Port-adhair Bhubaneswar / Stèisean Rèile agus a 'gluasad gu taigh-òsta. Feasgar feasgar gu teampall Lingaraj, Khandagiri Udayagiri Jain Caves. Feasgar an-asgaidh aig Dinnear Ekamra Haat agus Overnight aig Bhubaneswar. An dèidh turas bracaist gu Satkosia via Angul. Gabh cuairt air bàta aig Satkosia Gorge far am faod thu mòran de Mugger agus Gharial a thighinn air feadh na bancaichean gainmhich. Feasgar a 'trekking air slighe nàdair. Dinnear agus Overnight aig Satkosia. An dèidh tadhal air bracaist BhitarkanikaS an Iar- Clàraich a-steach don ionad againn. Às dèidh sin, cruinnich lòchran lòchrain dachaigh gu Kalibhanja Diha Island air bàta dùthchail air aontachadh le Roinn na Fiadh-bheatha, gus sealladh farsaing de làrach Ramsar a mhealtainn. Turas feasgar teampall Jagannath airson pàirt a ghabhail ann an Darshan Live Aalati. Air an fheasgar tlachd às a 'champa le snacks agus dinnear. Tadhal air saor-làithean Jungle Sand Pebbles. Às deidh turas brèagha stoidhle dachaigh a dhèanamh gu Tèarmann Tìge Similipal. Clàraich a-steach don taigh-òsta. Às dèidh coiseachd nàdair lòn agus sgrùdadh nàdair aig sgoil-àraich lusan, tadhal air tuathanas briodachaidh Crocodile. Dinnear agus thar oidhche aig Similipal. An dèidh turas bracaist gu Barehipani agus Joranda Waterfalls agus Jungle Safari. An uairsin tadhal air Raon Chahala. Dinnear agus thar oidhche aig Similipal.